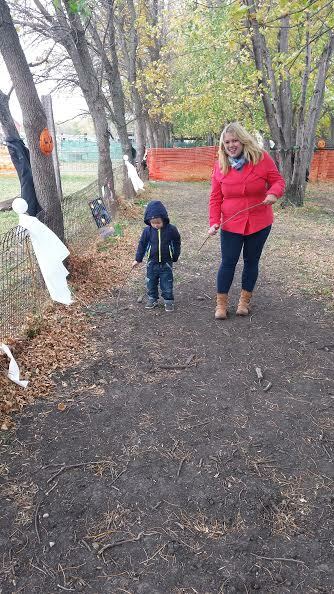 The official ‘before’ picture, captured over the weekend at the pumpkin patch. When dealing with health, you deal with a lot of numbers. I don’t like numbers and I don’t care much for precision. I deal in feelings, in words, in spirituality, in the variables of humanity. Just put a flower wreath on my head and call me Sunshine. But I met with a doctor yesterday and I received the results of some blood tests. Numbers assigned to my chart, to gauge where I am and where I should be. Ranges. I debated over posting this information, since it’s personal and not exactly flattering. But I decided as part of my journey the tradition of transparency must continue. Good! The Synthroid I am taking for an underactive thyroid is working. My fasting glucose was 96. Not-so-good! Anything over 100 is pre-diabetes and anything over 125 would indicate diabetes. My free insulin was 40. Bad! This is double the high end of normal. Twice as much insulin is being pumped through my body as should be. As suspected, I am insulin resistant. This is just the proof. The doctor wants to put me on metformin, but I have an international trip coming up so I’m not going to think about that until I return. In the meantime, I need to learn more about what insulin resistance actually means for my dieting choices. Any advice is welcome! After getting those results, I figured it couldn’t get any worse, so I went out and bought a scale to replace my broken one. I purchased a model which measures weight, body fat, water, muscle and bone. This seemed like a lot of information for $19.99 but I went for it. I know the BMI is controversial so I won’t take my severe risk of death based on this one calculation too literally. However. although this is day nine of my blog, I’m going to reset and deem this day one of my journey. Because now I’m adding accountability into it. I will ‘weigh in’ next Thursday and see what results I have. And who knows. Maybe at some point in my journey I will learn to love numbers! Or at least the ones pertaining to me.